So I have seen Thankyou waters here and there but I don’t really know what they’re about so I haven’t really been buying them. Though I do know that they somehow benefit some kind of charity/those who are less fortunate. However, this video was on my Facebook feed today and I admit at first I thought Coles and Woolworths (the two largest retail grocery stores in Australia) were working together to make this happen when in fact, Thankyou is a separate organisation that is trying to get Coles and Woolworths to stock their products on their shelves. This is what I understand the program to be: essentially, Thankyou wants to empower Australians by giving them the opportunity and link to fund projects to get fresh water for those living in less fortunate countries and possibly living in poverty. I’m probably not explaining this very well (sorry!) but you can go to their website for more information about their movement. Thankyou wants us to show how we feel about them selling products at Coles and Woolworths and of course I’m ALL FOR IT. In the video, they mentioned that they will price it competitively and many great people are on board in creating the products to make sure that their products are at least on par or better than their competitors. If all that is true, I feel like switching as much of my necessities as possible to the Thankyou brand. It’s so easy to join this campaign. To join, Thankyou suggested to either make and post a video or simply post a quick comment on either or both of Coles and Woolworths‘ Facebook pages expressing your opinion. As for me? Well, I’m posting this on my blog and I will share this blog post on both retailers’ Facebook pages. Although the readers of this blog is nowhere near a significant number, I just thought this is worth sharing anyway. I hope you’ve been having a great day and I’ll post again soon! –Disclaimer: I am not sponsored by the Thankyou brand in any way and all oppinions are my own. I am just an ordinary supporter of Thankyou and its causes. Today I would like to talk about Rubbing Alcohol. I have recently learnt that this not-so-expensive product is actually very versatile and useful. 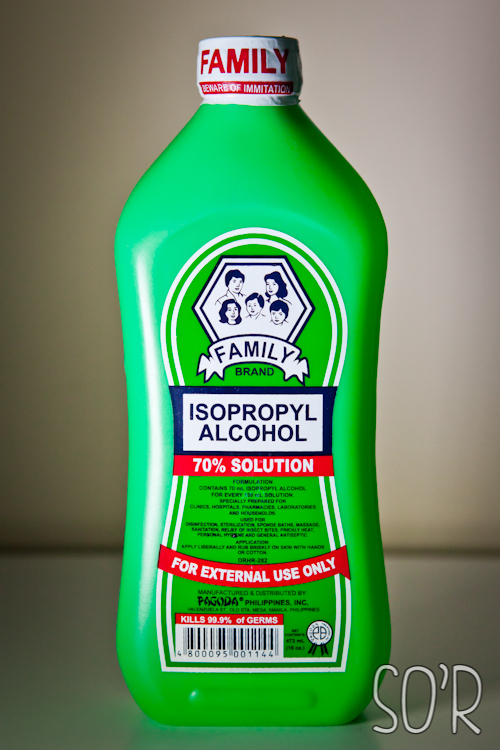 Before that though, I want to say that there are cheaper rubbing alcohols around rather than the Isocol brand (the one with the dinosaur on it) they sell at most pharmacies and grocery stores. Though that one is probably the most convenient one to get. However, I don’t know about you but I refuse to pay AUD$10 for one bottle of this stuff. I actually wanted to get some rubbing alcohol since a while ago but I thought that I still had some at home. Being quite unfamiliar with the stuff, I had no idea that they have an expiry date nor did I know much use of them other than cleaning cuts (which I never do) and to clean walls before you stick things (like hooks) on it. So, long story short, my supply at home was “expired” and I had to throw it out (I searched online whether they can still be used for general cleaning around the house but they all said that the chemicals have somehow changed or something – sorry not a chemist). But again, I didn’t want to spend another $10 to get the bottle which most of its contents will probably end up in the bin again like the last one. Luckily enough, I held out buying it long enough to come across this particular brand at the asian grocery store at Canning Valle (Perth) which costed me around $5 a bottle. The bottle looks pretty similar if you ask me. Green, same size. Just different brand/sticker and a different lid (click here to see what the Isocol rubbing alcohol looks like). So what “other uses” did I manage to find for rubbing alcohol? Personally, I used it to fix my broken blush like one of the many tutorials around on YouTube. The easiest (and laziest, but in a good way) is probably Kandee Johnson’s tutorial. But you can search many others on the internet or if you prefer, a video version on YouTube. So I hope this post will benefit at least ONE person out there and I’ll post another post soon! So about a month ago I saw a post by Crissey from HelloCrissey on Tumblr on how she did a DIY Panda Face Sweater. I’ve always loved the Giant Panda and frankly I’m always drawn to tops that has a panda face on it. Not to mention, the official mascot of the residential college I attended is a Giant Panda. So I decided to take the techniques and templates from Crissey’s tutorial and made my own Panda T-Shirt. Since mum already had the needle and thread, all I needed was the t-shirt. I went to search for a good, comfortable plain white t-shirt that are super affordable (I never like to spend money on overpriced stuff). I tried looking at many places both online and offline stores. In the end, I unexpectedly found some at Coles by Mix Apparel. I picked up 2 T-Shirts from the clearance section – one more fitting and the other loose fitting. Though the colour is a little more like cream than it is white, I thought this would make the tee looks less “harsh” and give it a “lived in” look which I love. I pretty much followed exactly how Crissey did it in her blog post (and used her template too – which printed to about half an A4 size) but I thought that I didn’t like how hers looked “bunched up” – like she pulled on the needle too hard while sewing. To solve this problem, I concentrated in stitching with very little “pull” and also used an embroidery hoop I had laying around. I also used “long and short stitch” to fill in rather than “satin stitch” as suggested by my mother to give it a more “natural” look at the end. 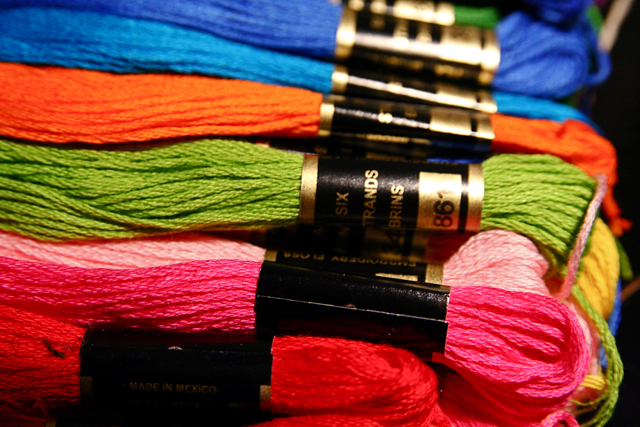 Click HERE for a few basic stitches and to see the difference between the two stitches. They ARE quite similar to each other. I used in total one embroidery floss plus a little bit more (maybe another 30cm), loading the needle with 2 out of the 6 strands of the floss at a time. In the end, because the T-Shirt material is so soft and stretchy (and super comfortable!) the stitching still looked like they were too tight. Luckily, I have a super-mum and she told me a very awesome trick! TIP: Iron the embroidery afterwards from the back side (so turn the t-shirt inside out) to lessen the “pulled” look. The project took me 2 days to complete – with breaks. I did this while watching TV-Shows/Movies/YouTube clips on my desk. Though I could have filled in more of the black, I think in the end I pretty much succeded this DIY and I can’t wait to start my next DIY Project! Don’t forget to follow Sprinkle O’Rainbow for more posts! Today, I want to share with you my love of tea and my new journey on trying out different types and flavours of tea. I grew up only drinking either a plain black tea with sugar or plain jasmine tea with sugar and occasionally some green tea. I love tea and I’ve always wanted to try a lot of different kinds of tea so a few days ago when I went to Coles (supermarket) with my parents, I saw that the Twinings teas were on sale for $1 a box! I thought this would be the perfect opportunity to start trying out different kinds of teas. I think that this is probably the best/cheapest way of trying out new tea flavours. I did go to Oriental Tea House before but the teas there go for around $10-$20/box (one flavour). I haven’t tried any of these teas before, nor am I affiliated with them. Be sure to subscribe to my blog and wait for my review on the individual flavours!